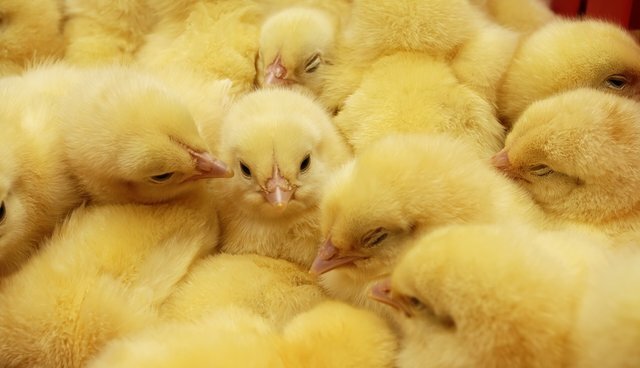 Bird flu catastrophe continues as the deadly pathogen sweeps the nation's factory farms, and millions of chickens and turkeys who have contracted the virus are being killed. The latest cases were confirmed in two wild birds in Kentucky on Tuesday, the New York Times reports, making Kentucky the 15th state where bird flu has already appeared since December. Bird Flu Spreads Across The U.S. Most recent data available from USDA/APHIS and New York Times, latest numbers ranging from December 19, 2014 to April 27, 2015. The dense conditions of the factory farms where these birds live mean that when a strain, say from a wild bird feather, somehow gets into the facility, the virus spreads incredibly fast, sometimes killing thousands of birds within 48 hours. The birds who have died or been killed to prevent the spread of the disease are composted for 28 days in heated temperatures, and then their remains are often spread on farm fields. "We now have abundant evidence that it's inhumane, overcrowded conditions in the poultry industry," Wayne Pacelle, CEO of the Human Society of the United States, says, citing the work of Dr. Michael Greger, who studies the phenomenon. "In nature, disease-causing strains of avian influenza rarely spread far because the birds sicken and die before they can fly to spread it to others. However, in unnatural, intensive agricultural systems, pathogens are more easily able to evolve from mild strains to dangerous, highly pathogenic forms," Dr. Greger wrote in an article last week on the outbreak. "Nine out of 10 chickens used for egg production in the U.S. are confined in barren wire cages. These cages are stacked in often windowless sheds that typically confine more than 100,000 animals each." Even though no humans have become infected with the virus yet, experts say it's not out of the question: "Nowadays, you can't say anything about flu with certainty," said Dr. Stephen Morse, an expert in emerging infections at Columbia University, told Reuters. As more and more cases are reported, concerns are escalating that the virus is spreading through tiny particles in the air. While some scientists believe warmer temperatures will wipe out the virus, others think the strain will return in the fall. But for millions of innocent birds, catastrophic damage has already been done.